Forsythia blossoms welcome spring - at last! While forsythia’s bright yellow blossoms are the harbinger of spring, they also mark the emergence of an impressive tree pest, eastern tent caterpillar. Since last summer this herbivore has survived as eggs deposited in masses on small branches of cherry, apple, and crabapple trees. Usually this noisome creature makes its appearance in mid-March, but this spring’s unseasonably chilly weather delayed their debut in the Washington region until this week. Tiny caterpillars are now hatching from dark brown, Styrofoam-like egg masses on twigs of favored host trees. More than 300 hundred larvae can be found in a single egg mass. This week caterpillars will be found near their egg masses hunkered down awaiting the appearance of nutritious young leaves or constructing silken tents. Larvae build small silken tents over the egg mass and the surrounding branch. From this bivouac, they move along silken trails to the newly expanded leaves on which they feed. Trail marking chemicals called pheromones are deposited by the caterpillars as they return to their tent after dining. These trail markers assist nest mates in locating delectable clusters of leaves. On the silk trail, sated caterpillars returning to the tent pass hungry ones leaving. As larvae grow during April, they expand their tents. Eventually tents are constructed in the crotches of large branches or where large limbs branch from the trunk. Eastern tent caterpillars are a rather chummy lot. Brothers and sisters from the same egg mass and nearby egg masses often participate in group activities such as communal foraging and enlargement of their remarkable tent. Tents help caterpillars conserve heat and elevate their body temperature for more rapid growth and development during chilly spring days. Their silken homes may also provide protection from predatory or parasitic insects. Small and sometimes even large trees may be stripped by hungry tent caterpillars. These hairy caterpillars have voracious appetites and en masse they can strip even large trees of their leaves. After the caterpillars have completed development, an exodus occurs from the tree and larvae wander the land seeking protected spots beneath logs, leaves, stones, and under man-made structures to spin yellowish or white silken cocoons. Adult eastern tent caterpillars emerge as moths from their cocoons in June or July, mate and lay eggs on small branches of rosaceous trees such as cherry, apple, and crab apple. These eggs house the next generation of caterpillars that will emerge with the bloom of forsythia next spring. How do you know if eastern tent caterpillars threaten your trees? The best predictor of a problem this year may be the problem you had last year. The images of this Bug of the Week came from a small stand of wild cherry trees that are perennially infested with eastern tent caterpillars. If you had a cherry, apple, or purple plum with tent caterpillars last spring, now is an excellent time to carefully inspect the pencil sized branches for egg masses and tiny silken webs. The egg masses with attendant caterpillars are easily removed with a pinch of the fingers, or if you are a bit squeamish about touching bugs, simply get out your nippers and prune them out. As the tents enlarge and move to the crotches of the tree, tents and their inhabitants can be removed with a gloved hand on a cool or overcast day, placed in a bag, and destroyed. The old-school remedy of “burning them out”, though dramatic, went out with the storming of Frankenstein’s castle. Flames are very damaging to the bark of a tree and should not ever be used. Pruning out egg masses and caterpillars now will eliminate problems later. Tall trees festooned with tents may be totally stripped of leaves. While trees may recover and produce a second flush of leaves, repeated defoliation probably reduces the vigor of trees. If you have a tall tree from which you cannot safely remove eggs or tents, you may want to seek the help of a professional certified arborist. For “do-it-yourselfers”, insecticides labeled for use against caterpillars and containing the active ingredients Bacillus thuringiensis (Bt) or spinosad will provide excellent control of these tiny leaf eaters. As with all insecticides, be sure to read and follow directions and cautions on the label and take special care if plants are in bloom and beneficial pollinators are present. 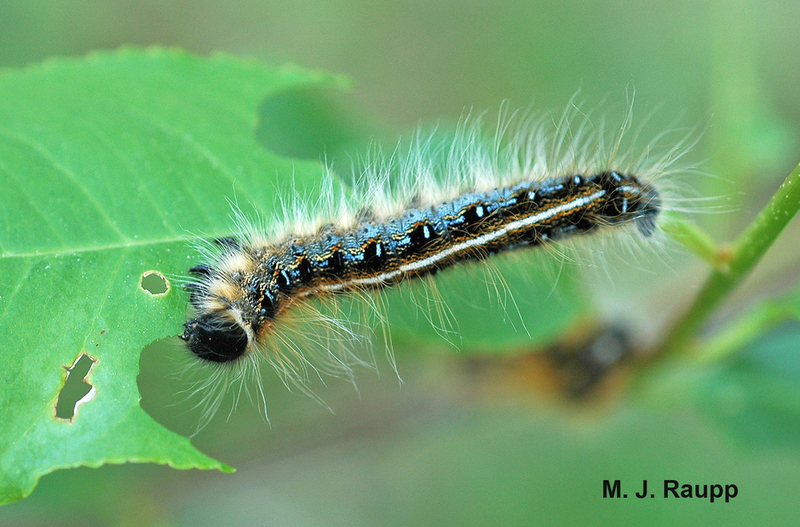 Entomologists believe that eastern tent caterpillar populations run in cycles. After a few years of caterpillar plague, natural enemies such as predators, parasites, and pathogens reduce tent caterpillars to innocuous levels. Let’s hope that Mother Nature’s hit squad of natural enemies puts a modest beat-down on these despoilers of our flowering trees and shrubs. The wonderful book “The Tent Caterpillars” by Terrence Fitzgerald and “Managing Insects and Mites on Woody Landscape Plants” by John A. Davidson and Michael J. Raupp were used as a references for this episode.